Columns are the most important parts of a structure. They transfer loads of the structure to the surrounding soil through the foundations. So we need to build strong columns, otherwise, failure will occur. Columns are built with two building materials, concrete and steel. Before designing the columns, civil engineers should calculate total stress due to live and dead load of the building. When the applied stress exceeds the permissible stress (calculated) the structure will fail. In this article, different types of column failures are discussed. When columns are axially loaded, the concrete and steel will experience some stresses. 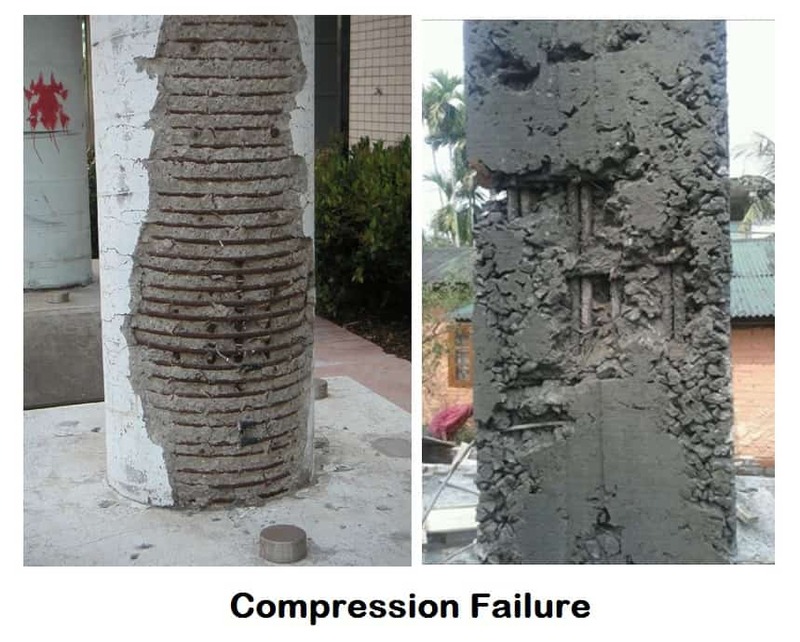 When the loads are greater in amount compared to the cross-sectional area of the column, the concrete and steel will reach the yield stress and failure will be starting without any later deformation. In this type of failure, the material fails itself, not the whole column. This type of failure mostly occurs in shorter and wider columns. To avoid this, the column should be made with sufficient cross-sectional area compared to the allowable stress. Buckling failure generally occurs in long columns. Because they are very slender and their least lateral dimension is greater than 12. In such condition, the load carrying capacity of the column decreases very much. The columns tend to become unstable and start buckling to sideward even under small loads.That means the concrete and steel reached their yield stress for even small loads and start failing due to lateral buckling. This type of failures can be avoided by not constructing long columns of slenderness ratio greater than 30. Also Read – Basic Construction Process Of RCC Columns. I am happy in your material and also I grasped a lot of knowledge.